Bear’s Paw Fabrics will be hosting a monthly sit and sew to benefit the Project Linus organization. It will be held on the fourth Wednesday of every month. 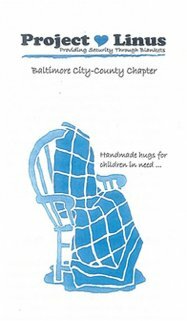 The Project Linus organization is in need of children’s blankets. They can be quilts, knitted or crocheted afghans or tied polar fleece blankets. Crib size is the most needed (36” x 36”) or (36” x 42”). So come with your fabric scraps or your yarn and your sewing machine and be prepared to have fun. We have some easy pattern ideas for you to use. Come anytime between 10 and 4. Bring your own lunch, snacks and drinks. We will be glad to help you with design choices. If you have any questions, please call the store at 410-321-6730.